What is Part P of the building regulations? Since 2005, if you’re doing any work on your home electrics, it needs to comply with ‘Part P’ of the Building Regulations - electrical safety in dwellings. That’s the law. It means whoever is carrying out the work needs to follow rules that make sure the work does not put you or your family at risk of fire or electric shock. Compliance with Part P is intended to keep you and your family as safe as possible from electrical hazards. The rules apply if you’re putting electricity into a new house or extension, or if you’re having an existing electrical installation adapted or rewired. What electrical work does this law cover? All electrical installation work in the home, garden, conservatory or outbuilding must comply with all the relevant requirements of the Building Regulations, including Part P.
Who is responsible for making sure any work complies with Part P? You are. By law, all homeowners and landlords must be able to prove that all electrical wiring meets Part P, or they will be committing a criminal offence. Local authorities can make homeowners or landlords remove or alter any work that doesn’t comply with the Building Regulations. What do you need to do before any electrical installation work can be carried out? 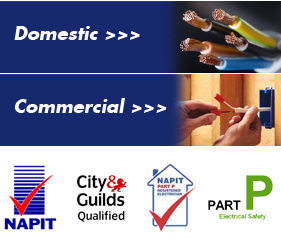 Employ an electrician registered with one of the government-approved Part P electrical self-certification schemes. You can choose to take out an insurance-backed guarantee when you have the work done, and you can make a claim if the work is later found not to meet the Building Regulations. What does Part P of the Building Regulations mean for you? A Building Regulations Compliance Certificate that confirms that the work meets the Building Regulations. Is it important who carries out the electrical work on your home? Yes. Electrical work must only be carried out by people who have the knowledge, skill and experience needed to avoid danger to themselves and others. It’s easy to make an electrical circuit work – it’s far harder to make the circuit work safely. We strongly recommend that you use a registered electrician to do any electrical work you need. They work to the UK national safety standard and will give you a safety certificate to confirm that their work has been designed, inspected and tested in line with that standard. The information above is sourced from the electrical safety council website, this is a excellent source of information for homeowners, tennants and landlords that want to be clear about their responsibilities regarding regulations that relate to electrical installation work. Bellow you can find some usefull links to information contained on the electrical safety council web site.